Services - Selland Construction, Inc.
Selland has extensive experience working with concrete. We have built numerous bridges and highway projects. Selland is accustomed to working in specialized conditions including, pile driving in and around waterways, dams, fish ladders, and many cofferdams and culverts throughout the western united states. Selland brings experience building all types of concrete and other structures, often times on tight schedules with little margin of error. From large scale irrigation canals serving hundreds of farms, to everyday agricultural and urban development drains and pipes; Selland continues to be the best option for your water delivery and disposal needs in the Northwest. Our motto is to do it right the first time, paying attention to your needs and the state and local requirements, building long-lasting solutions.  Selland is a leader in the construction of highways and airports and has participated in the building of major roadway and airport projects valued at over $20 million. We offer a special blend of experience and efficiency that enables us to safely construct, rehabilitate, and replace civil infrastructure projects to exact specifications. Selland has an extensive background working with a diverse range of clients including government agencies, municipalities, developers and private land owners, providing us with a measurable advantage in managing roadway projects. From local thoroughfares to major interstate highways and technically challenging road alignments, we are experts in roadway construction and the unique demands of airport construction. We have built strong relationships with major oil and gas producers in the region, earning our reputation as the "first-call" service provider. Selland Construction has a long history in working with the railroad. We are committed to the Railway Company's expectations of safety, meeting project schedules and quality. Our railroad experience ranges from track embankment, placing box culverts, installation of subballast and compaction of subgrade. We also have the capacity to respond with crews and equipment on train derailment sites within 24 hours of the derailment. We are committed to meeting the Railway Company's needs. Pipe and Utility installation requires experienced pipe layers as well as utilizing the right equipment. In order to ensure Selland crews are meeting safety environmental regulations, our project managers and field staff are trained in all the latest methods and procédures to meet the specifications and standards of every aspect of the job. Water and wastewater treatment projects are uniquely complex, consisting of thousands of pieces and specialized equipment customized to each project. It requires a team skilled in coordinating the timing and application of thousands of pages of submittals, drawings, and operating instructions. Our goal is to build the job as effective and economically efficient as possible. Selland successfully provides alternatives that have saved owners money as well as allowing faster delivery of the completed project. Through our experience, we develop and manage quality projects, while resolving concerns before they impact construction timelines and goals. Our skilled development and construction professionals have a unique track record of completing high-quality projects throughout the western United States. This rigor gives us the confidence to assume all accountability as your single source of delivery. At Selland, we specialize in "moving dirt". We have a fleet of over 100 pieces of equipment including 25 scrapers, 12 dozers and all the equipment to support our mass excavation operations. Selland can move dirt with accuracy, speed, and strategy. Selland Construction has moved over 200 million yards since 1958, ranging from Landfill Construction, Site Development, Highways and Roads, Earth Dams, Oil-well Locations, Dairy Farms and Agricultural, and Open Pit Mining.EARTHWORK & LANDFILLS At Selland, we specialize in "moving dirt". We have a fleet of over 100 pieces of equipment including 25 scrapers, 12 dozers and all the equipment to support our mass excavation operations. Selland can move dirt with accuracy, speed, and strategy. Our long history of developing turn-key subdivisions from concept to constructing the infrastructure has allowed our own destiny for clients and ourselves. Selland has developed and played a key role in hundreds of residential and commercial subdivisions. As a full turn-key operation, Selland provides site work, underground utility installation, curb and gutter work and concrete or asphalt paving surfaces. From beginning to end, Selland is the contractor to turn to first. In turn, Selland Construction engages constructing golf courses as it commingles with housing development. We are engaged in new construction, design/builds, and remodels of existing courses. Selland helps achieve the architect's vision from tee to green.